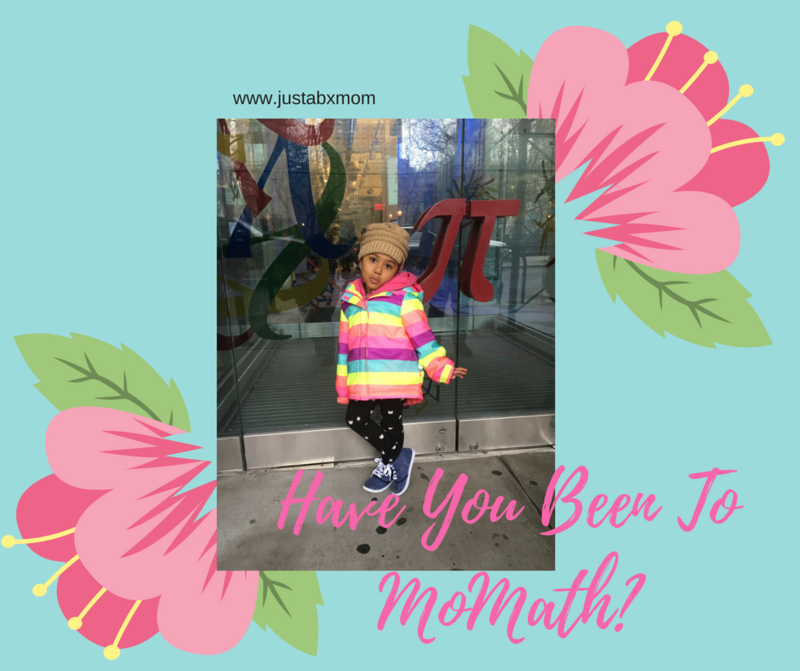 Have You Been To MoMath? Recently I read an article talking about why littles in the US are behind their counterparts in other countries when it comes to math skills. It said the reason was simple, we don’t make math skills a priority. We all have heard that we should start reading to our babies from the beginning (and I do mean beginning). I remember me and my niece reading to JustaBXgirl while she was baking in my belly. Yet, I doubt many of us started introducing math at the same darn time. I know I didn’t. Did you? I also have never been a huge fan of math while reading has always been one of my favorite past times. I don’t want JustaBXgirl to be intimidated by math like me. Fortunately, she is still young enough that her feelings towards math can still be positive. We play the Zero Math game pretty regularly where I ask her what a random number + 0 equals and she knows the number doesn’t change. Then I ask her what 0 + the same random number equals and she can usually tell me that the number doesn’t change. We also spend time counting things. And that’s probably the extent of math that we have going on. Little did I know that we live in the only city in the country, yes, THE COUNTRY, with a math museum!!! Don’t be jealous, if you’re in NYC area you can claim it as yours too. And if you’re not then you can always visit. The Museum of Mathematics (MoMath) has been around for about four years and is two levels of fun for everyone. It’s very hands-on and is open seven days a week. You and your littles will have so much fun that you won’t realize how much you’re actually learning. The exhibits are a great reminder that math really is a part of our everyday lives in more ways than we even realize. It’s also really cool to discover how math really is everywhere. And if you think your older littles might see right through your attempt to educate them on a “fun family outing,” don’t worry. Once they’re pedaling bicycles with square wheels they too will be convinced. There are also a lot of programs for littles and parents to participate in throughout the calendar year. Check out their website to see what they have going on now. I’m looking forward to a mom night out at one of their adult only nights. A lot of their programs are geared towards school aged littles because well they’re the ones we want to get interested in the topic.